T-top delineator Post | Alpine Products, Inc.
– Standard with molded lower handhold grip. – Convenient T-top carry handle (A Bent Mfg. Co. exclusive) and molded in bolt hole for flashing light (new longer handgrip area). – Improved recesses create a deeper area for reflective bands – stronger ribs provide maximum band protection. 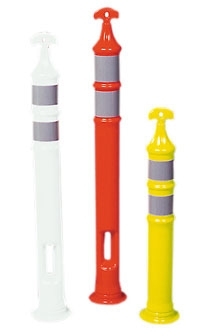 – Bent T-top delineator posts are manufactured using state-of-the-art technology. New precision molding machines produce consistent, high quality parts. – Tested and ertified to meet the crashworthy requirements of NCHRP-350.